In my search for something to blog about today, I was looking through my folder of things to post and I came across something I started to write about in 2009. I clicked on the link and was happy to see that the website is still active and it is current. So the organization is STILL going strong. So amazing. Still makes me teary-eyed, which is what happened when I first heard about this. Nine years ago when I was looking for something to post about and I turned on the TV. There was a story about The Glass Slipper Project. “There is a woman in Chicago who started the Glass Slipper Project 10 years ago. It is an organization that collects dresses to give to girls that otherwise might not have a dress to wear to the prom. According to what I was watching there were 700 girls lined up to get a dress. The project has helped 13,000 girls. That was April 24, 2009. So it has been 19 years and The Glass Slipper Project is still going strong. According to the website they have helped more than 20,000 girls get decked out for prom. The website does show that there are sponsors, now. I just love this idea of helping girls in need of prom dresses being able to actually get them – for free . . . . and shoes, jewelry, and make-up. Buying all of that for prom can be very expensive. When I first started this post, in 2009, there was The Princess Project in San Francisco. Their website said that they had helped over 9000 girls in the Bay Area since 2002. Now their website – http://princessproject.org/locations/ – shows they have five locations in California. It also looks like I just missed the event in the South Bay Area and the other Northern California locations, but is seems like Southern California has yet to have their giveaways. I could be off on the dates since each location seems to have their own website. I am not clicking over and scouring the pages, I am clicking over and scanning. So if you are interested in getting a dress or interested in volunteering or donating, please click over to the site and review the information. The Glass Slipper Project in Chicago looks as if their dress give away is in April. This is a great thing for people needing dresses and for people who need to get rid of dresses. It is a great way to give things another life. So many clothes end up in the landfills, this is a great way to help a person out and to keep clothes out of the landfill. 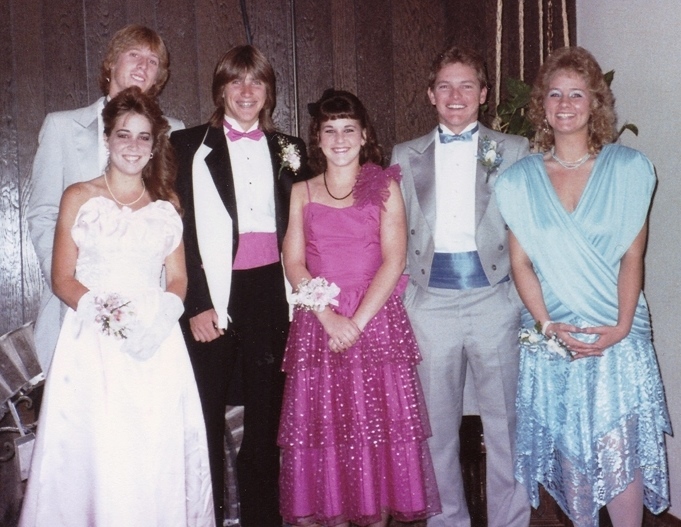 PS: The picture is of me and my friends at our prom. In the 80’s. Of course, you could tell that.